Thanks to slackening global demand and a massive wave of (allegedly) illegally subsidized imports, the steel-making business is a hard place to make profits in now for U.S. companies, but despite that, Nucor keeps delivering solid results. Even as the American economy has steadily improved over the past several years, the steel business has been slow to rebound fully. It has enjoyed some bright spots, such as automotive and residential construction demand growth in recent years, but the slowdown in global growth -- especially in Asia -- and weak domestic nonresidential construction have played big roles in keeping American steelmakers from fully benefiting from the recovery. But through it all, Nucor Corporation (NYSE:NUE) continues to operate profitably while much of the competition struggles to reach the break-even point. On the surface, these declines in earnings and revenue from the year-ago quarter don't look that impressive, but there's a lot more to the story. Domestic steelmakers are dealing with nearly unprecedented pressure from imports, as nearly one-third of the U.S. steel supply now comes from abroad. And relative to expectations, the company's earnings per share in the quarter were actually stellar. Not only did Nucor handily beat the roughly $0.50 per share most analysts were expecting, it also crushed the company's own $0.45 to $0.50 guidance issued in September. Nucor and other U.S. steel industry players have united to fight alleged steel dumping by foreign producers. The domestic industry contends that a number of countries are propping up their own steel industries, illegally subsidizing steel manufacturing so that they can continue producing at current levels and selling into the U.S. market at below cost, even as global demand weakens. The softening of China's economy -- and economic output -- is one of the prime factors affecting the steel business. Nucor CEO John Ferriola said that China is on target to export more than 100 million tons of steel this year -- more steel than the entire American industry produced in 2014. But even with these pressures, Nucor continues to operate profitably. The key driver of that success is the company's mini-mill strategy, which keeps it much more cost-competitive in weak demand cycles like the one American producers are facing now. While many of its competitors, such as U.S. Steel (NYSE:X) and AK Steel (NYSE:AKS), rely more on traditional foundries with much higher fixed-cost structures, Nucor (as well as competitor Steel Dynamics (NASDAQ:STLD) ) are able to reduce operating costs much more substantially when demand is weak. Ferriola described it as a "lower and more variable" cost structure, and it's a clear competitive advantage for the company. 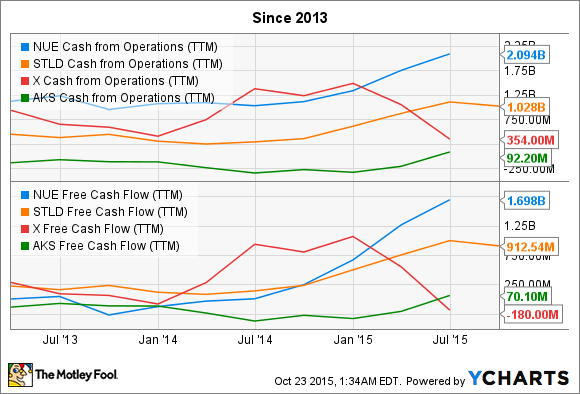 NUE Cash from Operations (TTM) data by YCharts. The chart above shows how, even in the challenging environment of the past year-plus, Nucor, and to a lesser degree, Steel Dynamics, have been able to continue generating strong cash flows, while others have struggled. In the first 8 months of this year, China's global steel exports surged 27% to 72 million tons. They are on track to exceed 100 million tons, which is greater than total U.S. steel production last year. Steel products from China are flooding into markets around the world, creating a domino effect as countries look for markets for their steel products. The massive increase in China's steel exports are provoking a wave of trade actions across the globe, including Europe, South Africa, Mexico, and India, as steel producers fight against the illegally subsidized steel imports being dumped into their markets. But even in these challenging times, Nucor continues to invest in taking market share and growing. Ferriola spent a lot of time describing investments in expanded capabilities in hot flat rolled sheet steel, high-strength low-alloy beams for a number of large construction applications, significant growth in its automotive business, as well as several other investments in enhanced capabilities. At the same time, competitors are struggling to maintain existing facilities. This year, U.S. Steel announced it would permanently shut down its Birmingham, Alabama, furnace, and would idle production in Illinois as part of a potential consolidation of its flat-rolled business. So far this year, there have been some legal victories in the battle against imports, with tariffs getting passed in 2014, and a number of current investigations into illegal dumping are making their way forward. However, import market share has actually increased since tariffs were rolled out last year so it's likely to be a long, hard-fought battle, and one that may get worse before it gets better. The nonresidential construction market also continues to struggle, with 2015's forecast activity at roughly 60% of its peak 2007 level. Nucor, however, continues to plug along. Its cost structure allows the company to continue to thrive and even invest in growth while competitors struggle. Historically, those investments have paid off for the company and its shareholders in the long run.